Cinema has a special kind of magic, one that's best served by a gifted, visionary filmmaker and even stronger when said filmmaker teams up with an equally talented visual effects maestro. It's Steven Spielberg and Ray Winston joining forces to bring dinosaurs back to life in the wondrous Jurassic Park, or John Landis and Rick Baker physically transforming an average guy into a monster in An American Werewolf in London. Or, for a more current example, it's Academy Award-winning director Ang Lee and his team of FX specialists who, together, are set to wow audiences this Thanksgiving weekend with Life of Pi, the Oscar-ready adaptation of author Yann Martel's acclaimed 2001 novel. Life of Pi (which opens today, in 3D) follows a young guy named Pi (played by Suraj Sharma), the sole human survivor of a shipwrecked freighter who's stuck on a floating lifeboat with an injured zebra, a rat, an orangutan, a hyena, and an aggressive Bengal tiger. Through flashbacks and visually stunning action set-pieces, Lee tells an intimate story with an effects-heavy scope and lush cinematography. Per numerous critics who've been praising the movie since its New York Film Festival premiere in late September, Life of Pi is a huge leap forward for both 3D technology and special effects as a storytelling device. So what better way to celebrate Ang Lee's artistic triumph than by laughing at all of those who've been unable to reach similar creative heights? That earlier statement about cinema being magical? In these cases, a better word would be "painful," or even "comical." 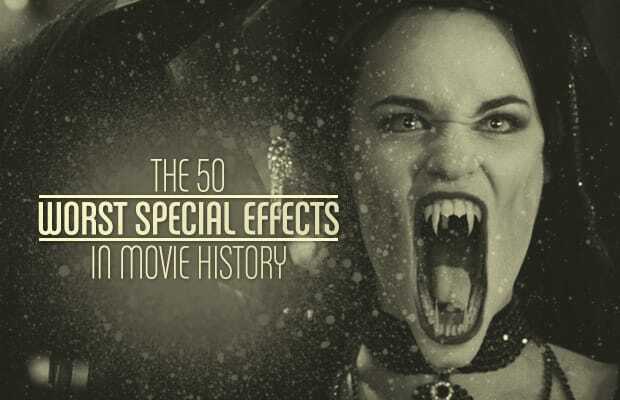 These are The 50 Worst Special Effects in Movie History—as you're watching Life of Pi this weekend, keep in mind how bad it could have been.